Sunscreen is definitely one of the less glamorous beauty products to buy, but it’s also one of the most necessary. We won’t head outside in the dead of winter with at least SPF 30 on our faces, much less the height of summer, so we daresay we know a thing or two about keeping our skin protected from UV rays. That said, there are a few spots that even we forget to hit with the SPF 50 on the hottest days of the year. These 10 areas are some of the most easily overlooked… and the most important. Don’t let them suffer this summer—and always remember that reapplying your sunscreen throughout the day is just as important as putting it on in the first place. Yes, you use your hands to apply sunscreen to the rest of your body in the first place, but that doesn’t mean you’re taking care to protect the less obvious areas, like the webbing between your fingers and the backs of your hands and wrists. That’s not even to mention the fact that most of us head straight to the sink to wash our hands once we’ve applied sunscreen. They say you can tell a woman’s real age from her hands—so be sure to get those areas covered next time. “Out of sight, out of mind” is not exactly the best approach when it comes to sun protection. Be sure to give your legs the full 360-degrees treatment before you head out in shorts or a bathing suit. If getting thorough coverage is a problem, get an aerosol spray sunscreen that you can use at any angle, like Kiss My Face Cool Sport with Any Angle Air Powered Spray – SPF 50. It’ll make getting to those hard-to-reach areas a non-issue. While your hair generally does protect your scalp from the harmful rays of the sun, an exposed part means that you’re still susceptible to scalp burns. We can’t imagine anything less appealing—or more buildup-causing—than rubbing a cream sunscreen into our roots and scalp, so opt instead for a stick formula. They’re more precise, so you can get the SPF right where you want it, not to mention far less greasy. Warm weather means sandals, which means that the thin-skinned tops of your feet are fully exposed to the elements. Always be sure to apply sunscreen on the tops of your bare feet before you put on your sandals—flip-flop tan lines are not cute. Not only are your lips crazy susceptible to burns, but the lower lip in particular is twelve times more likely to develop skin cancer than the upper lip. We’re not suggesting that you slather sunscreen all over your mouth (please don’t! ), but rather use an SPF lip balm like Supergoop! Fusion Lip Balm with SPF 30+. Reapplication is key, so keep the balm on hand to refresh throughout the day. We generally tend to focus on the main features of our faces—the cheeks, the nose, the forehead—when we apply sunscreen while bits like the tops of our ears go unprotected. Just use your sunscreen of choice to cover your ears, as well as the space behind them. Even if it’s covered by your hair, the back of the neck, is a super sensitive, burn-prone area, so make sure that you’ve covered it—and the front of your neck, too! Sunscreen in your eyes is one thing, but sunscreen on your eyes is another. Your eyelids are the thinnest skin on your body… and, if you’ve ever fallen asleep on the beach, you’ll know just how quick they are to burn, and how painful said burn can be. A thick, balmy sunscreen formula is ideal for the lid area, and it’s also wise to choose one that contains natural ingredients and as few chemicals as possible to avoid feeling the burn. Don’t neglect the areas covered by your bathing suit, because it’ll never stay in exactly the same place, especially not the straps. 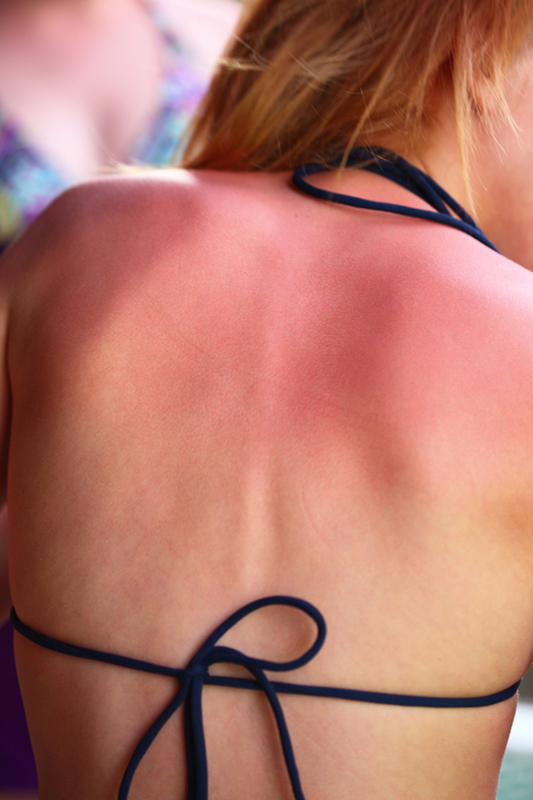 We’ll go right ahead and say it: Apply your sunscreen while you’re still naked, because just because you’ve got clothing or a bathing suit covering an area doesn’t mean you’re immune to burns. You want your SPF to cover your whole body, not just where you think the sun will hit. Better safe than sorry! Even if you don’t plan on waving your hands in the air, the underarm area is one that frequently goes neglected, particularly the foldy skin around the area. (Don’t be embarrassed—we’ve all got it.) Apply sunscreen both in your armpits and in that area around it, front and back, to avoid weird burns in weird places. Read more from Daily Makeover: Do Sunscreen Alternatives Really Work?